My plan was to camp at Hanging Dog CG near Murphy NC when I left my friend’s place. Instead, I continued on into Tennessee in search of a secluded boondocking spot. 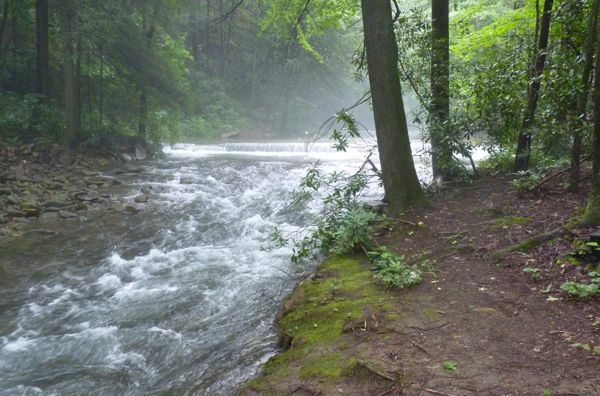 Deep in the Cherokee National Forest is a NFS camp called Tumbling Creek. I found the turn-off and followed directions along two forest roads; up and down and around hair-pin turns with steep drop offs. A one lane gravel road, rutted and rocky here and there, with trees and vegetation crowding the road. Only small rigs, jeeps and pickups should attempt it. After 5 miles I finally arrived at what appeared to be Tumbling Creek; as it certainly was tumbling. 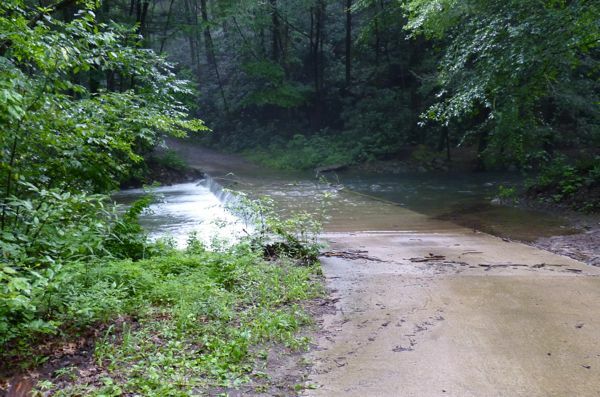 No one had mentioned the road crossed the creek before getting to the campground. It was a concrete slab though, but submerged in water and a limb stuck in the middle; I wasn’t about to try it in Tardis. I later saw a few pickups and jeeps ford it with no problem. Why bother, as there was a great site right at the crossing. Plenty big enough for my rig and I was able to get level without using pads. 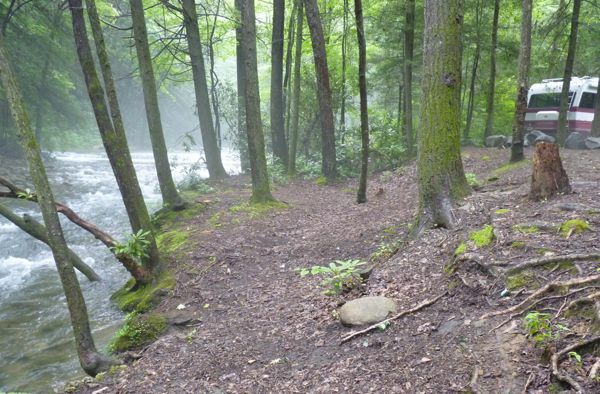 An ideal site right next to the cascading creek and a safe distance above the water. Fortunately, I arrived early enough to nab a great camping spot. Hiked around the area and found another camp across the road, but the parking spot was too small for my rig. Would make a great tent camp though. Returned to the rig and made up some baked beans with onion and brats for lunch. Enjoyed listening to and watching the creek while I ate. For sure no internet out there. But to my surprise, 2 bars of 3G and, with the booster, 3 bars of 4G LTE. Wow! So I stayed a just had to stay a couple of days for free. In fact I will be crossing Ohio sometime around early September. My route will be east to west a bit north of I-70. If you’re anywhere near that I’d love to drop by to meet you. Thanks for the invite. I’m 12 or 13 min off 70, easy to get to. Tumbling Creek looks like a beautiful place to enjoy for a couple of days. Did it inspire you to paint? (I notice there hasn’t been much talk of painting in your blog since you’ve been on the road. Have you been painting? If not – it is understandable that your new life onthe road may need a period of “adjustment” to find your groove).